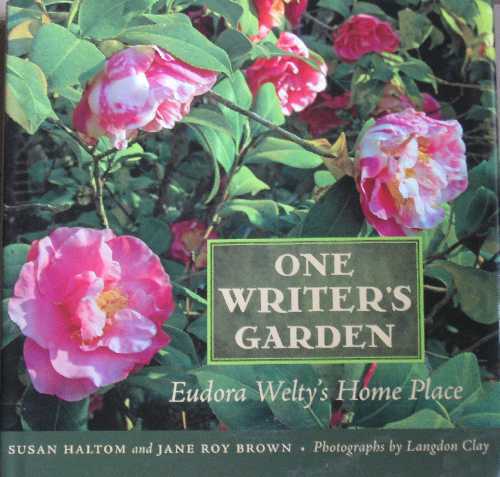 One Writer’s Garden: Eudora Welty’s Home Place seems just the right book for those of us who love flowers and who are contented with the simple garden made beautiful by that love. This book, compiled by garden designer Susan Haltom and landscape historian Jane Roy Brown, with beautiful pictures by noted photographer Langdon Clay, is more than just about gardening. Tucked within its pages is the story of the unique bond between one of the world’s greatest writers, Miss Eudora, we call her in the South, and her mother Chestina Andrews Welty. The garden, begun in the 1920s, spans the years slightly beyond World War II, when Chestina’s health and Welty’s increasing fame as a writer, took most of their leisure time and the garden fell into disrepair. Lucky for all of us, Miss Eudora gave her home to the state in the 1980s, to be administered by the Mississippi Department of Archives and History. The story of the refurbishing of this garden is inspirational and will have you digging in the earth whether you are inclined to or not. Lots of information, such as the introduction to fence movement in 1920s; the placing of vases in the new cars for refreshing interiors; the beginning of the garden club movement; as well as the plant list for each phase of the Welty garden will mesmerize even the most indifferent of gardeners. Book club discussion questions are also included, as well as notes on each chapter in this lovely book, plus an extensive bibliography. A really lovely book, and you will even delight in such admonitions, expressed by one writer of the 1920s, that if “women of this country took more interest and spent more time in their gardens, and less in frivolity, fewer would suffer from nervous prostration, and the necessity for the multitude of sanitariums would be avoided.” Would that which ails the American psyche be so easy to solve.